The role of an IT Help Desk Support is to provide technical and troubleshooting assistance for issues pertaining to System hardware, software, mobile devices or other tools. 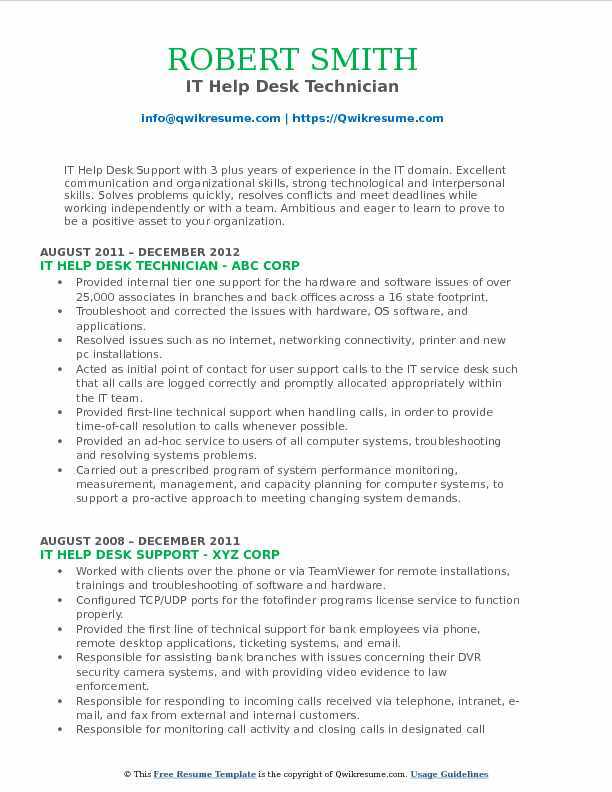 A typical sample IT Help Desk Support Resume highlights duties such as – providing technical assistance through phone or email, performing remote troubleshooting service through diagnostic techniques, delivering effective solutions, providing accurate information on IT product and service, following up and updating customer information and status; installing computer peripherals and training computer users. Some of the essential skills considered valuable by employers include –proven work experience, outstanding working knowledge of database, remote control, and office automation products; ability to diagnose and solve technical issues, a good understanding of tech products, mobile devices, and computer systems, and customer-oriented approach. The level of education varies based on employer, but most of the candidates hold a college degree in the relevant subject. Objective : Junior IT Help Desk Support professional with 4 years of experience is seeking to work as an IT Business Analyst in a challenging and professional environment and allowing expansion in areas of expertise or other domains of Technology. Skills : MS Word, Excel, PowerPoint, Outlook, Explorer, Problem Solving: Troubleshooting Network Problems, Internet Connection Issues, Printer Connection Errors, And Login Problems Hardware/Software: Changed And Replaced Various Computer Components. Assisted in determining requirements and developing plans to ensure smooth installation and documentation of new software and applications. Performed analysis/troubleshooting of pcs peripheral devices including printers. Performed scans on PCs ensuring network devices are 100% compliant with latest security patches. Scheduled, tracked and deployed Windows 7 to over 250 desktops for employees on the network. Performed capture and restore of users profiles using Microsoft System Configuration Management (SCCM). Installed software applications manually and through SCCM on desktops. Created a developing knowledge base of common user issues, descriptions and resolutions. Researched and implemented wireless presentation prototypes for use by executives. Repaired computers, laptops, and networks, with knowledge of all the hardware and software involved in a dormitory environment. Summary : Senior IT Help Desk Support professional with 8 plus years of experience is looking for a position where I can use my experience and knowledge of new IT methodologies to provide quality customer service for the growth and success of the company. 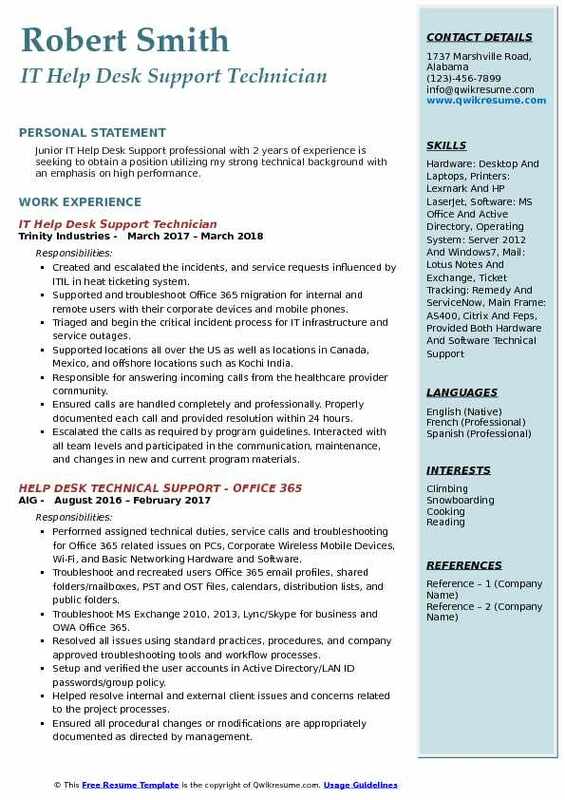 Skills : CP/IP, UDP, ICMP, DNS And Network Management Tools, Ticketing System, CISCO Routers And WAN Communication Protocols, Excellent Software And Hardware Computer Knowledge, Effective Time Management And Prioritization, Team Working, Effective Team Dynamics. Answering, evaluating and prioritizing the incoming telephone, voicemail, email, and in-person requests for assistance from users experiencing problems with hardware, software, networking, and other computer-related technologies across a global company. Configuring and installing the Windows workstations and Macintosh operating systems in response to the demands of a complex network design. Accessing the software updates, drivers, knowledge bases, and FAQs resources on the intranet to assist with end users issues. Installing, certifying and troubleshooting the campus and remote-campus network cabling infrastructure including, a wide variety of local area network equipment and software. Training the end-users on the use and features of the various operating systems and applications on various platforms. Demonstrating the customer service skills, such as actively listening to customers in order to understand each issue and situation, providing proper follow-up and status updates. Headline : Great Customer Service Skills. 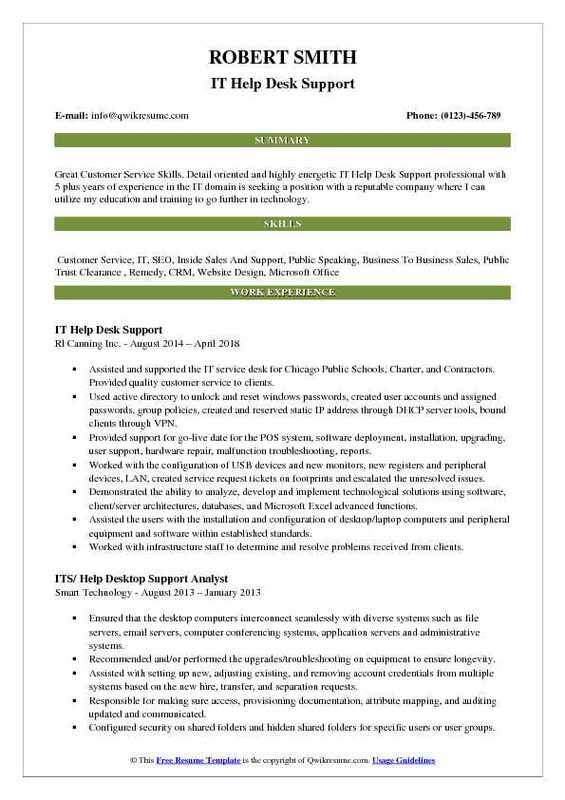 Detail oriented and highly energetic IT Help Desk Support professional with 5 plus years of experience in the IT domain is seeking a position with a reputable company where I can utilize my education and training to go further in technology. Assisted and supported the IT service desk for Chicago Public Schools, Charter, and Contractors. Provided quality customer service to clients. Used active directory to unlock and reset windows passwords, created user accounts and assigned passwords, group policies, created and reserved static IP address through DHCP server tools, bound clients through VPN. Provided support for go-live date for the POS system, software deployment, installation, upgrading, user support, hardware repair, malfunction troubleshooting, reports. Worked with the configuration of USB devices and new monitors, new registers and peripheral devices, LAN, created service request tickets on footprints and escalated the unresolved issues. Demonstrated the ability to analyze, develop and implement technological solutions using software, client/server architectures, databases, and Microsoft Excel advanced functions. Assisted the users with the installation and configuration of desktop/laptop computers and peripheral equipment and software within established standards. Worked with infrastructure staff to determine and resolve problems received from clients. Worked with vendor support to resolve technical problems with desktop computing equipment, software and IT related hardware. Objective : Jr. 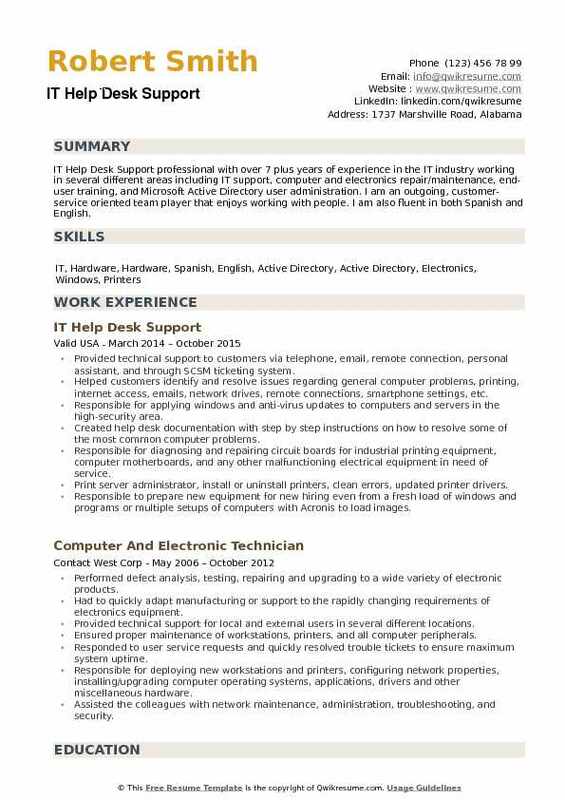 IT Help Desk Support professional with 3 plus years of experience is seeking to obtain a position that will enable me to use my strong organizational skills, educational background, and ability to work well with people. Responsible to resolve queries of customers through e-mail, phone, and chat within established TAT. Managing and taking ownership of the resolution process for all customer related issues. Recognizing the problems outside the CHD environment and escalating to the respective functional support groups. Using the appropriate tools to document all pertinent details of support inquiries: HP Service Manager Ticketing System, Outlook, PHI Tracking Tool, etc. Maintaining up to date knowledge and assimilate quickly to product enhancements and releases. Understanding and complying with security and support policies and procedures. Troubleshooting, repairing and upgrading the mission-critical PC and MAC computers, peripherals, and mobile devices. Troubleshooting, installing and upgrading the software applications and operating systems on network attached computers. Installing the computer peripherals and setup software and the operating system to allow computers to connect to the network and computing resources. 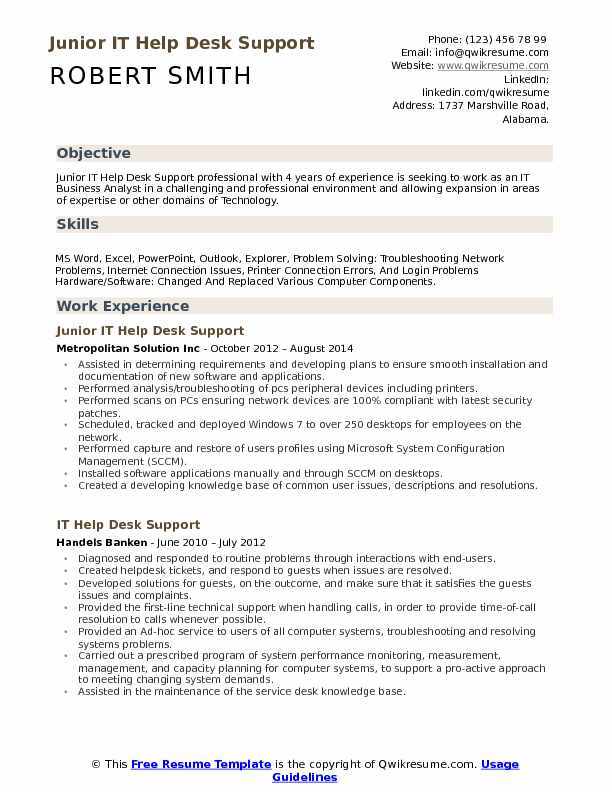 Objective : Junior IT Help Desk Support professional with 2 years of experience is seeking to obtain a position utilizing my strong technical background with an emphasis on high performance. Created and escalated the incidents, and service requests influenced by ITIL in heat ticketing system. Supported and troubleshoot Office 365 migration for internal and remote users with their corporate devices and mobile phones. Triaged and begin the critical incident process for IT infrastructure and service outages. Supported locations all over the US as well as locations in Canada, Mexico, and offshore locations such as Kochi India. Responsible for answering incoming calls from the healthcare provider community. Ensured calls are handled completely and professionally. Properly documented each call and provided resolution within 24 hours. Escalated the calls as required by program guidelines. Interacted with all team levels and participated in the communication, maintenance, and changes in new and current program materials. Provided prompt and accurate responses according to service level agreements. Proactively identified the opportunities to improve upon existing process flows. 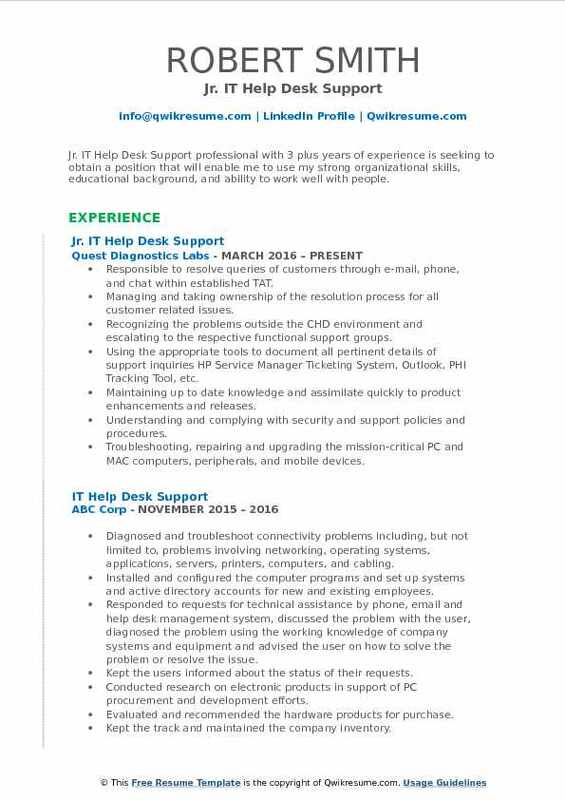 Headline : IT Help Desk Support professional with 5 plus years of experience is seeking to contribute to the overall success of a company in a position of diverse responsibility which, requires strong organizational, planning, problem-solving and follow-through skills. Skills : Networking: Internet Protocols, Routing Protocols, DHCP, DNS, TCP/IP, Web Servers, Technical Troubleshooting, Hardware Configurations. Offshore Team Collaboration, Software Installs, Preventive Maintenance, User Support, Technical Support, Customer Service. Assisted with setup, structuring and support of the service desk after bringing it back in-house to assist 500 local, national and global internal users with basic troubleshooting and problem-solving. Installed and set up, repaired desktops/laptops for the upgrade, replacement, maintenance. Used Team Viewer to remote into users PC for desktop support, hardware troubleshooting (laptops/PCs/printers, subway POS), test software releases, installations, error resolutions, LAN configuration, back up, imaging, restoring, clearing cache, tune-up PC. Created restoration points, input tickets into footprints and documentation, incident tickets and description for training purposes, backups, recoveries. Acted as a liaison between desktop support and technical support team to get users issues resolved promptly, participated in customer/employees technical troubleshooting through calls. Responsible for assisting employees with iPhone email setup and troubleshooting. Responsible for shipping out and receiving/documenting newly received equipment for the entire department. 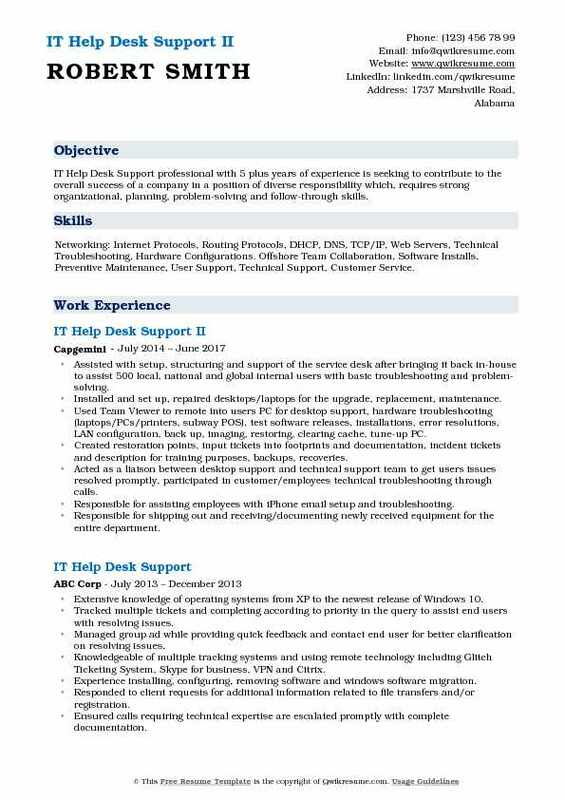 Objective : IT Help Desk Support with 3 plus years of experience in the IT domain. Excellent communication and organizational skills, strong technological and interpersonal skills. Solves problems quickly, resolves conflicts and meet deadlines while working independently or with a team. Ambitious and eager to learn to prove to be a positive asset to your organization. 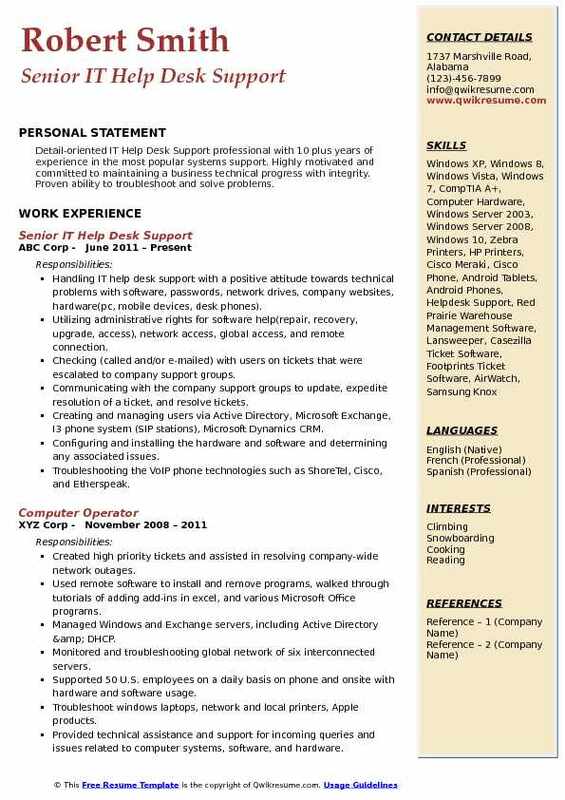 Skills : Hardware: Desktop And Laptops, Printers: Lexmark And HP LaserJet, Software: MS Office And Active Directory, Operating System: Server 2012 And Windows7, Mail: Lotus Notes And Exchange. Provided internal tier one support for the hardware and software issues of over 25,000 associates in branches and back offices across a 16 state footprint. Troubleshoot and corrected the issues with hardware, OS software, and applications. Resolved issues such as no internet, networking connectivity, printer and new pc installations. Acted as initial point of contact for user support calls to the IT service desk such that all calls are logged correctly and promptly allocated appropriately within the IT team. Provided first-line technical support when handling calls, in order to provide time-of-call resolution to calls whenever possible. Provided an ad-hoc service to users of all computer systems, troubleshooting and resolving systems problems. Carried out a prescribed program of system performance monitoring, measurement, management, and capacity planning for computer systems, to support a pro-active approach to meeting changing system demands. Assisted in the maintenance of the service desk knowledge base. 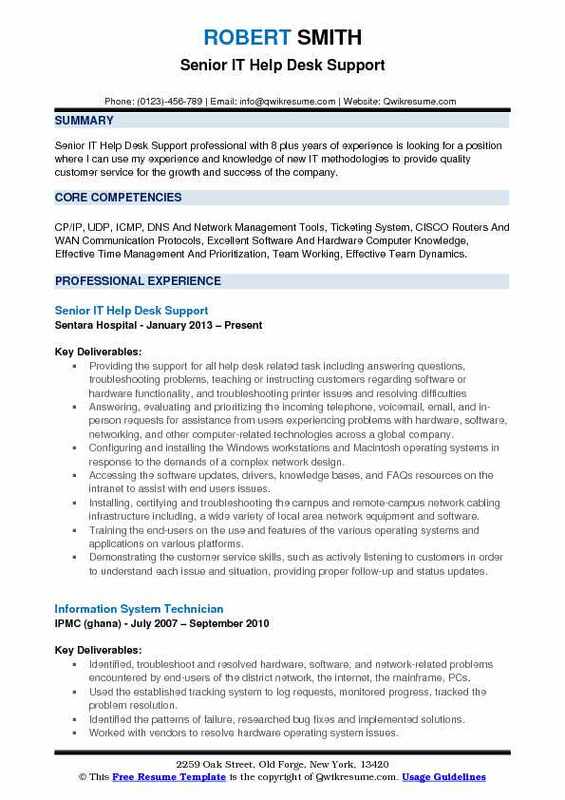 Objective : IT Help Desk Support professional with 2 plus years of experience is looking to obtain a challenging position in a fast-paced environment that will allow me to extend my skills in communication with customers, organization, and leadership. Unlocking the user accounts and resetting the passwords, performing troubleshooting duties for end users. Verifying and maintaining the user accounts through active directory, issued SQL hot ids for qualified users. Remotely troubleshooting and diagnosing the user laptop and desktop computers by using Dameware, directing the users on self-diagnosis. Remotely pushed software to user computer by using System Center Configuration Manager (SCCM), pushed various software applications (Adobe, Adobe Acrobat, Microsoft Office). Navigating through various mainframes to keep user accounts current and functioning. Receiving an average of thirty-three calls a day, document each call and incident through service now ticketing system. Monitoring, troubleshooting and ensuring the timely completion of internal and external help desk tickets. Examining and resolving the customers’ and corporate and store employees’ issues. Summary : Detail-oriented IT Help Desk Support professional with 10 plus years of experience in the most popular systems support. Highly motivated and committed to maintaining a business technical progress with integrity. Proven ability to troubleshoot and solve problems. Handling IT help desk support with a positive attitude towards technical problems with software, passwords, network drives, company websites, hardware(pc, mobile devices, desk phones). Utilizing administrative rights for software help(repair, recovery, upgrade, access), network access, global access, and remote connection. Checking (called and/or e-mailed) with users on tickets that were escalated to company support groups. Communicating with the company support groups to update, expedite resolution of a ticket, and resolve tickets. Creating and managing users via Active Directory, Microsoft Exchange, I3 phone system (SIP stations), Microsoft Dynamics CRM. Configuring and installing the hardware and software and determining any associated issues. Troubleshooting the VoIP phone technologies such as ShoreTel, Cisco, and Etherspeak. Providing support for employees across the company. Troubleshooting printers, network, and computer issues. 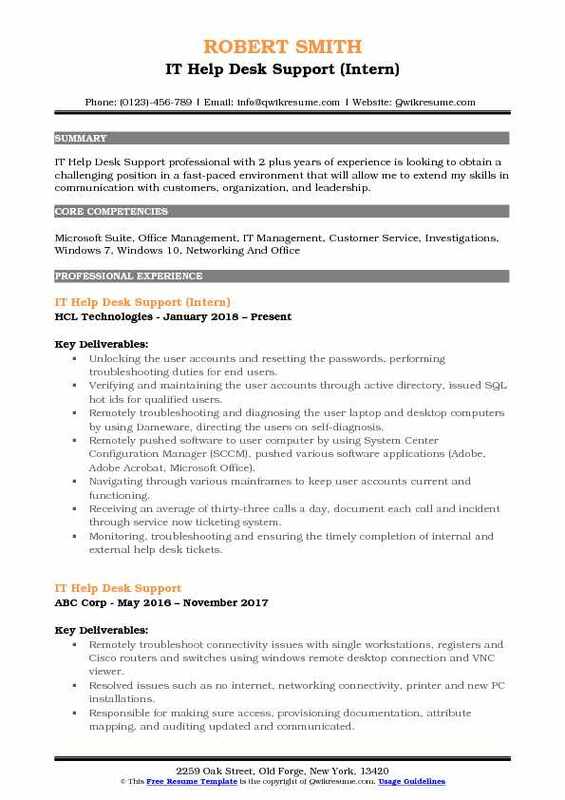 Summary : IT Help Desk Support professional with over 7 plus years of experience in the IT industry working in several different areas including IT support, computer and electronics repair/maintenance, end-user training, and Microsoft Active Directory user administration. I am an outgoing, customer-service oriented team player that enjoys working with people. I am also fluent in both Spanish and English. Provided technical support to customers via telephone, email, remote connection, personal assistant, and through SCSM ticketing system. Helped customers identify and resolve issues regarding general computer problems, printing, internet access, emails, network drives, remote connections, smartphone settings, etc. Responsible for applying windows and anti-virus updates to computers and servers in the high-security area. Created help desk documentation with step by step instructions on how to resolve some of the most common computer problems. Responsible for diagnosing and repairing circuit boards for industrial printing equipment, computer motherboards, and any other malfunctioning electrical equipment in need of service. Print server administrator, install or uninstall printers, clean errors, updated printer drivers. Responsible to prepare new equipment for new hiring even from a fresh load of windows and programs or multiple setups of computers with Acronis to load images. Prioritized and responded to help desk tickets using proper recording practices. Assisted with laptop and mobile device set-up, imaging, and installation, as required.